It was such an honour to be one of twelve UK Naval Engineering Science and Technology (UKNEST) 2016 scholars. UKNEST invited all the scholars for a visit to Devonport, Plymouth on Wednesday, 2nd November 2016. As much as I was excited about it and looking forward to the day, I was also very stressed as I had an exam on 1st November and then an assignment deadline on 3rd November. At least I was pleased that my visit to Plymouth doesn’t clash with my exam date. So after finishing my exam at 6.00 in the evening on Tuesday, I headed to the station to catch my coach. After quite a long night journey from Leicester, I finally arrived at Plymouth nice and early the next day, around 6.00 in the morning. The event kicked off at the Wardroom, in the HMS DRAKE around 10.00 in the morning with a warm welcome from the Naval Base Commander. Her Majesty’s Naval Base (HMNB) Devonport, is one of three operating bases for the Royal Navy in the UK. In the 17th century, it was established as a Royal Navy dockyard, and now is the largest naval base in Western Europe. Following the welcome meeting there was a workshop – “Engaging with the ‘Millennials’ to promote the Year of the Engineer – 2018”. It was great to participate in it and to see how the UKNEST is taking an active role in promoting engineering especially the Defence and Naval sector to the younger generation. The day was jam-packed with workshops, tours, and visits. So our first visit was to the Devonport Dockyard Frigate Refit Complex (FRC). I was really amazed to see a Dockyard in operation and all sort of engineering work was going on. Following that, we all went to visit the Royal Navy Ship ‘HMS Monmouth’, which is also known as the ‘Black Duke’. HMS Monmouth is the warship with the highest number of battle honours than any other serving frigate. It was no doubt a great experience to visit this ship and to hear from the Royal Navy officers and engineers about their amazing work for the defence. It was a fantastic opportunity to explore the ship including the control room, main deck, cabin etc. 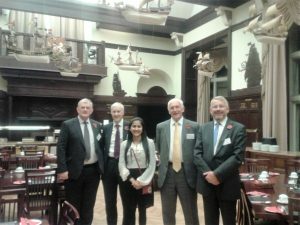 For the scholars, UKNEST provided this wonderful opportunity to meet and network with so many high up industry experts from General Electric, Thales, Babcock, Royal Navy etc. Apart from the visit to Devonport, this scholarship program also offers Mentorship. The day concluded with a nice dinner at the Wardroom, HMS DRAKE with all the UKNEST board members, industry experts and other scholars. After a long and wonderful day, we finished around 10.00 at night. A bit exhausted but I thoroughly enjoyed all the visits, networking, and the workshop. Without a doubt it was an amazing experience. The day was well spent and then I again head to the station for another long night journey back to Leicester. I want to give a bit more information about the Scholarship Application Process. The Application process involves submitting an online application along with an essay on Autonomous technology, a CV, and a reference letter. Once you done the first phase, the second stage is a face to face interview and a presentation. I was asked to present my essay, and was followed by an interview. The interview was a mixture of motivational, competency and technical questions. I highly encourage/recommend other students to apply for it and who knows you too can have a wonderful opportunity to visit the Devonport and meet the industry experts. I am more than happy to help with any questions for the application process or anything in general. Hi I am Oishi, a Software and Electronics Engineering student back at the University for my final year following a wonderful placement year at Rolls Royce. I will be blogging about everything from my industrial placement experience, final year studies to what I get up to in my free time. Stay tuned to read about all the great experiences I am going to share about the University and hope to give you an insight into the life of a student at the University of Leicester till I graduate.